Our July cover girl Lady Gaga dyed her hair platinum blonde (she was a natural brunette) to keep people from likening her to Amy Winehouse. While her astounding talent is obviously what made her the star she is today, switching up her look also played a part in that. Hair dye has always been a surefire way to get a drastic makeover. Shades of caramel and brown can warm up and soften your features, while jet blacks and deep reds make you look mysterious, fierce, and untouchable. You can even go purple if that's what floats your boat. There's a whole host of hues to choose from, from ultraconservative to ultraviolet. The biggest problem with hair dye, though, whether you're still sporting virgin hair or you can't even remember what your original color looked like anymore, is that it's always been more than a little uncomfortable to use. The dye stings the scalp, the awful smell burns in your nose, and there's a good chance the coloring treatment will leave your hair a little more dry, brittle, or fragile. The chemicals in traditional dye—ammonia especially—can be very damaging to your hair and your health. Now you can get fabulous color without the breakage, the pain, or even the smell. After over a century, L'Oreal has finally come up with a permanent hair color formula that uses oil instead of ammonia. (Ammonia is the powerful ingredient that opens up the cuticles to let color in. It's also the ingredient that smells horrifyingly bad.) Color and comfort are no longer mutually exclusive. L'Oreal INOA (Innovation, No Ammonia) is the latest permanent color treatment to hit the salons. Featuring an oil delivery system instead of the traditional ammonia-heavy formulas, INOA makes the dye experience a lot less painful without lessening its effectivity. And the components of the hair color system are even mixed in front of you with precise measurement, ensuring that you get the same desired effect, anywhere you get it. The first thing you notice is that the formula goes on slick and smooth. It's extremely oil-rich, so its texture is soft and creamy compared to traditional dyes. It feels like a hair masque when your salon technician brushes and massages it in. The next thing you notice is that you don't smell anything. The lack of ammonia in the formula means that INOA is odorless. You don't have to deal with the sharp chemical smell while the product is in your hair, and you don't have to worry about it lingering in your locks after your treatment. Finally, as you sit in your salon chair waiting for your hair to absorb the color, you notice that (if you've experienced the hair dye process before) there's a lot less sting. The sting's not completely eliminated, but there's far less pain and irritation than there used to be, especially for sensitive scalps. The new formula delivers the same results as traditional, ammonia-rich, chemically-laden hair dye: gorgeous color, minus the damage. INOA has 44 shades to choose from, from deep black to bright blonde, and the color comes out rich and beautiful. As an added bonus, instead of feeling damaged and dry, hair post-treatment actually seems even softer and smoother than it was before coloring. It looks and feels like you just had a hot oil, or a similar nourishing treatment--like it was completely rejuvenated. Who knew getting a chemical treatment could actually be good for your hair? And the good news? It lasts that way, with proper care and treatment. INOA hits local salons this month. So if you're due for a color retouch, or feel like you can dare try coloring your hair for the first time, now's the best time to do it. 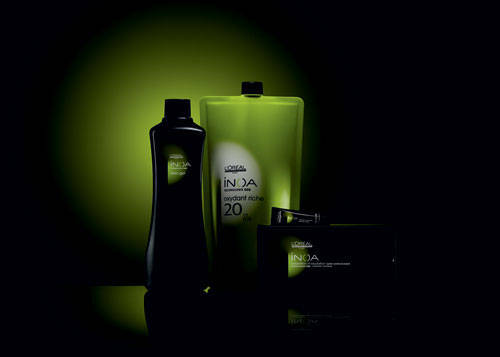 If your hair has been treated recently, ask your favorite salon if it would be safe for you to try INOA this soon. If not, wait until you can, and enjoy the experience. Ask about INOA in Straight and Smooth Salon (Vernida I bldg., 120 Amorsolo St., Legaspi Village, Makati, 759-5105) and Regine's Salon (2F The Link Building, North Drive corner Makati Avenue Makati City).